The origin of the human allantois is thought to be the posterior wall of the yolk sac, which forms a small diverticulum and then extends into the connecting stalk. 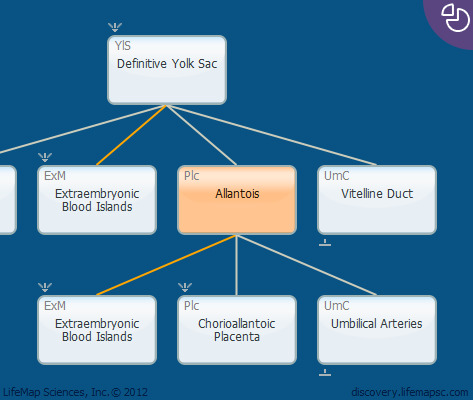 The allantois is responsible for the induction of placental development and is the site of extraembryonic vasculogenesis, which occurs independently in the mesodermal wall of the allantois and contributes to the formation of the umbilical vessels. Allantoic vasculogenesis begin from the distal tip of the allantois, which contains mesoderm, and progresses both distally, to fuse with the chorion and form the placental labyrinth, and proximally, to connect with the dorsal aorta. The urachus is the proximal portion of the allantois and is continuous with the urinary bladder. Postnatally, this structure forms a fibrous stalk called the median umbilical ligament, which extends from the urinary bladder to the umbilical region. Develops between Carnegie stages 6-7. In the mouse, the allantois (literally "sausage") develops from epiblast (primitive ectoderm). It consists of a core of mesoderm overlaid by part of the lining of the exocoelomic cavity, into which it grows from the posterior end of the primitive streak by a combination of mitosis and distal cavitation.